For our August Community Spotlight, we have chosen to feature Carmen Doakes and the Jordyn Doakes Foundation. This organization brings community awareness to a unique birth defect. Ms. Doakes has agreed to share her personal experiences with her daughter’s condition, while giving support to other parents that face a similar situation. Tell me about the Jordyn Doakes Foundation. The Jordyn Doakes Foundation was founded because my daughter was born with a rare congenital defect Tibial Hemimelia (absence of the shin bone). I was told amputation was the only option for Jordyn until I found a doctor in Florida that saves the limbs of children who was also told they had no other options. After parents reaching out to me to find out about Jordyn’s journey I knew it was my purpose to help families know what their options are so they can make the best decision. We also have a community outreach program to help children in the community and provide resources and help uplift, and motivate, children in our community. What is the greatest accomplishment that the organization has achieved to date? We have provided many resources and helped to build awareness about the condition to many families who research different treatment options to prevent their child’s leg from being amputated. What type of assistance/support do you provide to families of children with limb deficiencies? We provide financial assistance and emotional support to families in need. Explain what Tibial Hemimelia is and the challenges that you’ve faced being a parent with a child that has the condition? TH is complete or total absence of the shin bones. Although there are many other limb deficiencies that children can be born with. This journey for Jordyn has been rough we travel from Florida on a monthly basis and at times we must be on Florida for long periods of time. My sister was also born in 1971 with TH and had both legs amputated at the age of 3 so I understand the world of amputation and reconstruction. 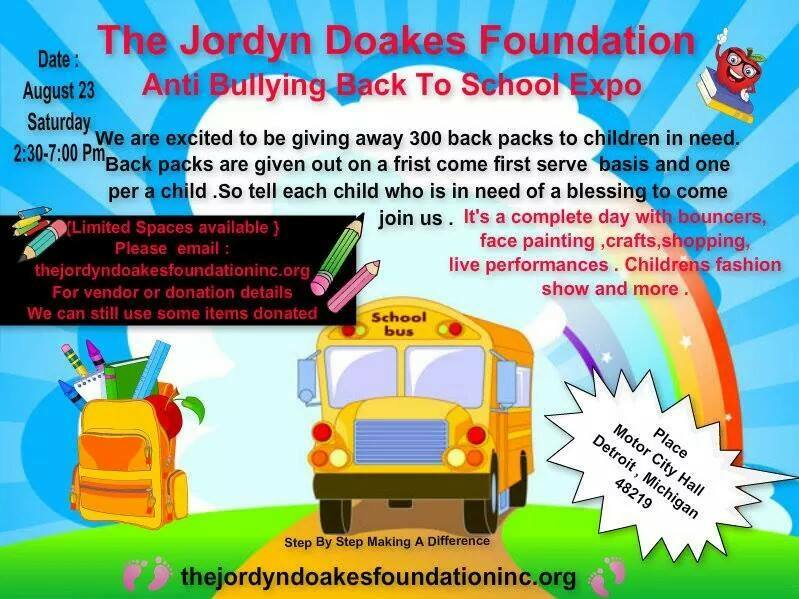 Describe what we can expect from the upcoming Back to School Expo, presented by the Jordyn Doakes Foundation (The Jordyn Doakes Back to School Expo took place Saturday, August 23, 2014). We will be educating children on the importance of not encouraging or participating in bullying, passing out pamphlets and doing fun activities with the children. We will have live performance which includes dancing, singing, poetry and skits. We will also have face painting, food, vendors for shopping and much more. There will also be a doctor there doing scoliosis and backpack checks. In what ways can people donate to the organization? If you would like to donate, you can go to our website (www.thejordyndoakesfoundationinc.org) or via PayPal (thejordyndoakesfoundationinc@yahoo.com) or visit us at our office location 15919 West 10 Mile Road Suite 207, Southfield, Michigan 48075.